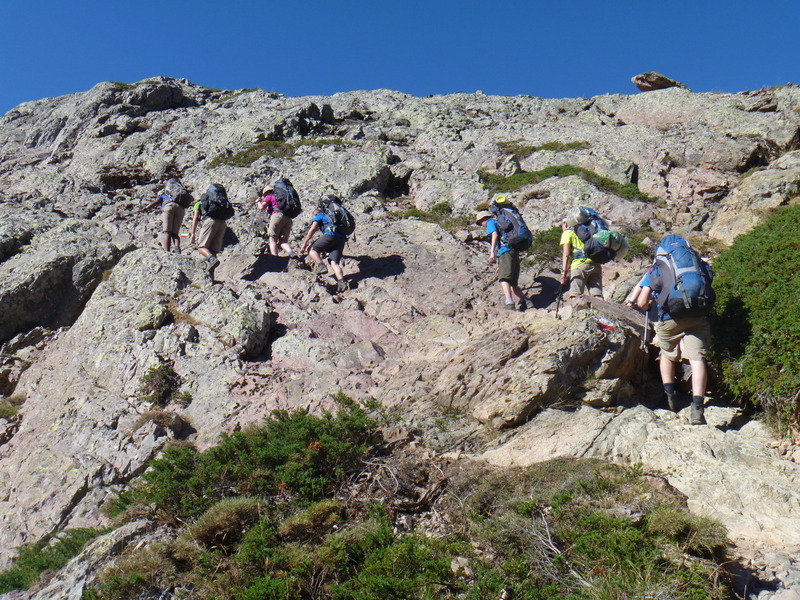 Staffordshire and West Midlands North Sector conducted Ex Corsican Dragon Venturer over the period 16-30 Aug 15. The aim of the expedition was to complete the northern section of the GR20. 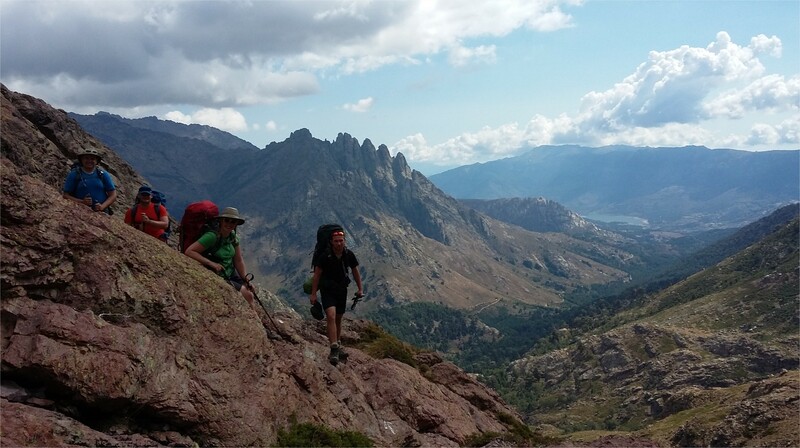 The GR20 is a long distance high altitude technical mountain trail that crosses the Mediterranean Island of Corsica. The route takes ten days to complete, covering a distance of 112km, with a total ascent of 7510m and descent of 6835m. The route winds its way through some stunning alpine mountain terrain, passing through high cols, past glacial lakes, down deep chasms, crossing bare granite slopes and almost impassable barriers equipped with chains, cable bridges and ladders. The GR20 North has gained a status as one of the toughest mountain trails in Europe something that all the expedition member would certainly now agree with. The team was 23 strong, consisting of 4 mountain leaders, 2 support staff and a mixture of 17 participating Cadets and Adult volunteers. Prior to departure the team spent 4 very wet and windy weekends training in the Snowdonia National Park on the Carneddau and Glyder ranges perfecting their mountain skills, developing their physical stamina and mentally preparing for the challenge ahead. The expedition flew from Birmingham to Bastia, Corsica and caught the local train to Calvi which is an experience in its own right. They established a base camp at Camping Dolce Vita. The next day was spent preparing for the expedition, purchasing food and last minute bits of kit before carrying out final checks and getting an early night in readiness for the first of many big mountain days. The route is only accessible by road at the end of stage three and six which tends to concentrate your mind. You only have the supplies and equipment that you are carrying and if you injure yourself, it’s either a very long walk out or an expensive helicopter ride. After a short bus transfer, stage one starts at Calenzana and takes you to the refuge at Ortu di u Piobbu, this sets the scene for the next ten days, heavy exped packs approaching 50lbs, 30 degree heat, bright sunshine and an ascent of 1600m over exposed steep rocky terrain followed by an uneven shelf to pitch your tent on at the end of a 9 hour climb. Stage two from Ortu di u Piobbu to Carrozzu and stage three to Haut Asco were probably either the best or the worst days of the whole expedition depending on your disposition. Both days start with very steep 975m ascents up to the head of the valley; this is then followed by some of the very best grade 1/2 ridge scrambling that went on and on for hours and then equally long and steep descents down into the valley below for yet another night of uncomfortable and broken sleep. Haut Asco is accessible by road which meant fresh food and electric. Having lived on porridge, cheese, pasta and washing in ice cold water for the last three days this was very welcome, a warm shower, fresh fruit, bread and a can of coke can certainly make you feel human again. Stage four, Haut Asco to Vallone had recently been closed due to a huge rock fall which meant taking a four hour bus journey to Calasima. This may have given everyones’ legs a rest but certainly not their nerves as the single track mountain roads were not ideal for a coach. With heavy packs after our resupply the expedition started the five hour trek back up into the high mountains, the Refuge at Vallone provided a spectacular campsite with panoramic views across the mountains and shallow pools to soak aching feet. Stage five from Vallone to Castel di Verghio was a long section. Due to fatigue, sore feet and taking into account what was still to come it was decided to complete this stage over two days. This made for shorter days with a high level camp at Ciottulu allowing time for everyone to recover before the next big mountain stages. The route from Castel di Verghio to the refuge at Manganu was different to what we had been used to, the terrain was starting to change from exposed rocky Mountains to high alpine pastures and dense forests providing some protection from the sun over the days 17km trek. Stage 8 to Petra Piana took us back to normality; this started with a straight up out of the campsite 4km scramble ascending 970m to an awe inspiring ridge with views across to the islands east and west coasts before a steep rocky path leading down to the refuge. Keeping your concentration at the end of a long hot day on these types of tracks was difficult but critical as slipping would have serious consequences. The expedition took the high level alternative to the normal GR20 route leading us to Onda, this was a short day but not for the faint hearted with five false summits ascending just over 500m before a knee and ankle busting 900m descent down to a flat comfortable campsite with warm showers. This was extremely welcome as the final day to Vizzavona was going to be tough and long. As tents were pitched in the shadow of tomorrow’s climb and having read the guidebook which states that the last stage should not be under-estimated it was decided that an early start would be advisable to ensure that do not miss the one and only train back to Calvi as an uncomfortable night sleeping on the station platform was not an option. We started the 670m ascent to the Col at first light and nearly three hours later finally made it to the high point of the day. The long 1000m descent into Vizzavona was a challenge in its own right covering 4km of exposed steep rock slabs before entering the forests providing shade from the midday sun. After several hours following the river down the mountain side though the forests avoiding tree roots we finally reached the train station at Vizzavona with time to spare. After a cold can of Coke, the expedition boarded the train for a four hour journey back to Calvi which provided a great opportunity to see other parts of the Island. Reaching Calvi in the late evening left just enough time to pitch tents, get a warm shower before dinner at the local pizzeria and then sleep. The expedition spent the next two days in Calvi carrying out post expedition admin and sightseeing or as was the case for many just sleeping and soaking aching bodies and sore feet in the warm sea. The journey back to the UK started with an early morning train ride back to Bastia and a short walk to the airport for our flight back to Birmingham and on to Stafford before departing for home locations. 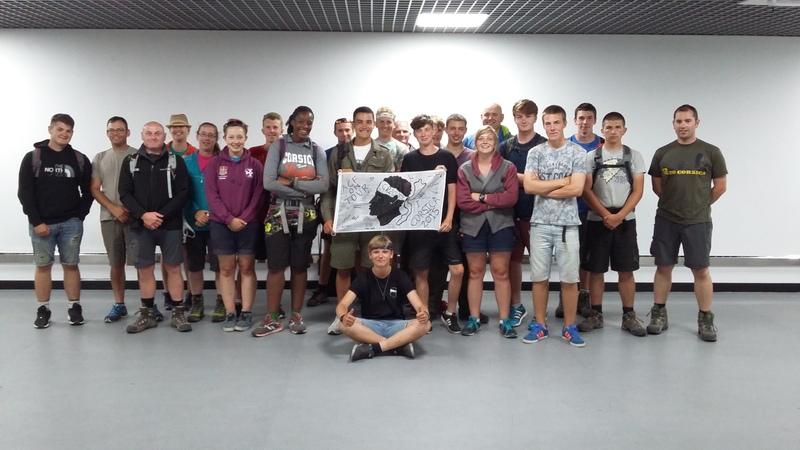 The expedition certainly met its aim with everyone completing the GR20 but also more importantly we departed from Birmingham with 17 young self-centred dependant individuals and returned with a team of independent mature young people. 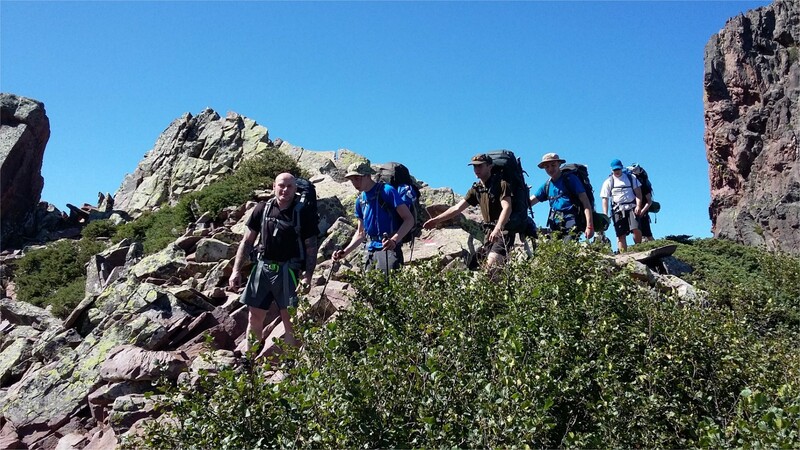 The expedition challenged them at every point, selflessness, courage, determination and self-discipline were constantly being used and developed to get the whole team across the finish line each day. Staffordshire and West Midlands ACF and everyone involved with the expedition would like to thank the Ulysses Trust for the very kind donation without which the expedition could not have gone ahead.